FIGHT!‘s “Alright Guy” Duane Finley goes toe-to-toe with FIGHT!‘s “Canadian Guy” E. Spencer Kyte in a UFC Fight Night 26 Faceoff. For this installment, Finley and Kyte take on the heavyweight throwdown between Alistair Overeen and Travis Browne. It’s been a rough start for yours truly coming out the gates for this Faceoff series. I’ve dropped the first two bouts in my rivalry with Canadian hipster Spencer Kyte, but in my defense, only a Canadian hipster like Spencer Kyte could sleep with those two sketchy wins under his pillow. With Ellenberger vs. MacDonald curing insomnia across North America, and Machida vs. Davis rewriting the way cageside officials score fights, the lines of victory have been blurred in our first two exchanges. That being said, for out third endeavor, Spencer and I have decided to choose a bout that has absolutely zero chance of ending in any other fashion than brutality. When Alistair Overeem signed with the UFC, there was a tremendous amount of expectation riding on his mountain range shoulders. While the Dutch wrecking machine jumped out to a hot start by mauling former champion Brock Lesnar, things have gone horribly amiss for “The Reem” ever since. A failed drug test and the ensuing suspension, coupled with suffering a costly knockout at the over-sized mitts of Antonio Silva, have Overeem’s back firmly placed against the wall. There is simply no other option for the former Strikeforce Heavyweight Champion but to come out in “Hulk Smash” mode, and that is what I expect to see in Boston. Browne’s biggest strength is being a rangy striker, and keeping things on the feet is a dangerous dance when Overeem is involved. The former K-1 Champion has world-class credentials in the stand-up department, and if Browne wants to trade punches, knees, and kicks, he’s bringing his game directly into Overeem’s wheelhouse. Granted, Overeem’s chin has been suspect over the course of his career, but Browne’s chin has also faltered recently. I believe Browne will do his best to fire away from the outside as he attempts to keep the footwork flowing, but with a stand up-heavy battle, it’s only a matter of time before Overeem picks up his timing and lands the heat. While two powerful heavyweights squaring-off rarely make it beyond the opening frame, I believe this particular tilt will see the second round, before Overeem seals the deal with a KO. My bitter friend from Indiana really doesn’t like the fact that I’m 2-0 right now, and as much as I like giving him the gears, I have to admit that I feel a little sketchy about my unbeaten record thus far. Not that I can’t make a case for Phil Davis winning that fight, but I’m 2-0 without a truly dominant victory, and that is what I crave. Hopefully that changes here. I’ve always believed that Browne has the skills and potential to be a force in the heavyweight division. I expected his fight with Antonio “Bigfoot” Silva to be where he made that move. Unfortunately, “Hapa” popped a hammy, lost the fight, and was forced to regroup. This bout, however, could be an even bigger chance to announce his presence as a force. Despite his recent loss to Silva, Overeem remains a marquee name, and a victory over the former Strikeforce Heavyweight Champion would certainly propel Browne into the title conversation. 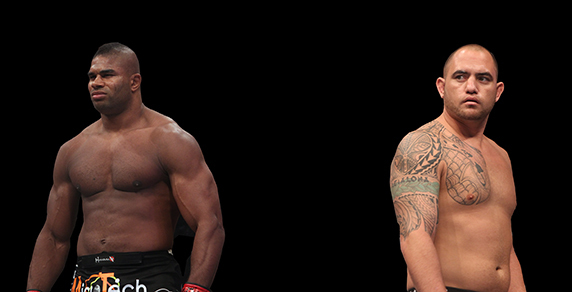 As much as standing with Overeem is a dangerous proposition, if the same disinterested, overconfident fighter who fist-pumped his way to the cage back in February shows up, the 14-1-1 Hawaiian heavyweight has this one in the bag. That being said, I do believe that even if the best version of “The Reem” strides into the cage on Saturday, Browne has the skills to get the job done. The Team Jackson-Winkeljohn fighter is the most complete opponent Overeem has faced in some time—an adversary capable of winning this fight with strikes, or submissions if the bout hits the canvas. Browne isn’t going to be a stationary target for the Dutch heavyweight, and he’s not going to strike from traditional angles and set-ups either. His movement and overall athleticism is what has always made him such an intriguing prospect, and I think we’ll see him use that here to keep Overeem off-balance. Like Duane says, Overeem has been touched up and finished in the past, and your chin only gets more fragile with each passing fight. I think Browne will stay out of danger, pick his spots to engage, and catch Overeem being overly aggressive, earning the biggest win of his career.